The ‘hour’ has struck, My sweet children: the time for the conscience of the world to be illuminated by the Power of the Most High – Live each moment as though it were your last – There is a large nebulous formation in the solar system, 3-4 times the size of Earth, and moving towards it; electrical charges and lightning bolts appear; cyclonic storms and extremely wild disturbances. LITTLE PEBBLE: As the Rosary was being offered, Saint Michael appeared, and Saint Barachiel is also visible; both are dressed in the style of Roman soldiers of Our Lord’s time, but in black with gold trimmings. Saint Michael carries a red sword; Saint Barachiel has a white Cross. I can see the globe of the world slowly turning; there is a black Cross above it – and much higher again is a white Cross, from which streams a wave of beautiful Light coming towards the Chapel, forming a very large and wide ‘road’ – it is similar in appearance to the ‘sunburst’ which is travelling towards the Earth right now – a great burst of energy – and is a very bright light. Behind the white Cross I can see the stars. Our Holy Mother emerges from the Cross with the Baby Jesus. She is dressed in black, with a brown scapular which is similar to that of the Saint Charbel Order, but it does not have the white Cross upon it. The Baby Jesus, however, is in white; He sits upon the left Arm of Our Lady, holding a golden Rosary. Both of Them look very serious. Following are many Angels; they, too, are dressed in black and all glide very swiftly towards the Chapel. As Our Lady arrives here and stands just above the Tabernacle I can see that She looks rather sad as She gazes – as does the Baby Jesus – at various souls in the Chapel. Our Blessed Mother kisses the Baby; He gives the Rosary to Her and both make the sign of the Cross. In the Name of the Father, and of the Son, and of the Holy Ghost. Amen. LITTLE PEBBLE: Our Lady moves over to Her left, then points to the Earth. I can see three large black Crosses – one is situated to the northeast of Suva – perhaps a thousand nautical miles (1,850 kilometres) from it, as a rough estimate; another Cross is visible in France, placed near the Pyrenees Mountains and towards Lyons; the third black Cross is located in what I believe is Iowa, in the United States. 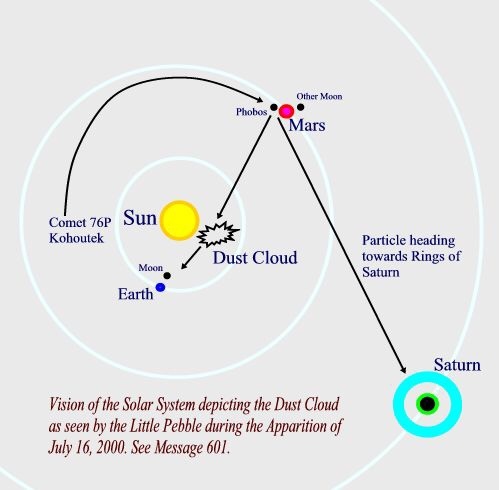 The solar system is shown to me; in it there is a large nebulous formation – what might be termed a ‘cloud’ – which is about three or four times the size of Earth and moving towards it. As it begins to enter the outermost reaches of the Earth’s ‘shielding’ troposphere, electrical charges begin to appear; bolts of lightning hit the surface of Earth and spear off, back into the atmosphere. The cloud formations around the Earth move very quickly, into patterns which indicate the presence of large cyclonic storms and it is obvious that these disturbances are extremely wild. Over the Earth the words “VERY SOON” are visible. LITTLE PEBBLE: Our Lady has sent all the Angels who have come with Her, down to the vision of the Earth which I have been shown – they encircle it – but I have no idea what they are supposed to do, nor who they are. In many regions, I can now see great numbers of small black Crosses all over the world; it resembles an enormous graveyard actually. Our Lady just nods. I have also been shown something else, but for the moment I will not reveal what it is. Our Lady and Our Lord move back and make the sign of the Cross once more. In the Name of the Father, and of the Son, and of the Holy Ghost. Amen. The Baby Jesus has been Blessing the world and as they both now begin to glide back to the White Cross we will continue to pray.